The Mimar Sinan Fine Art University’s ambitious Paintings and Sculpture Museum (set to officially open in 2016) is hosting a temporary exhibition of landscapes by some of Turkey’s greatest artists. 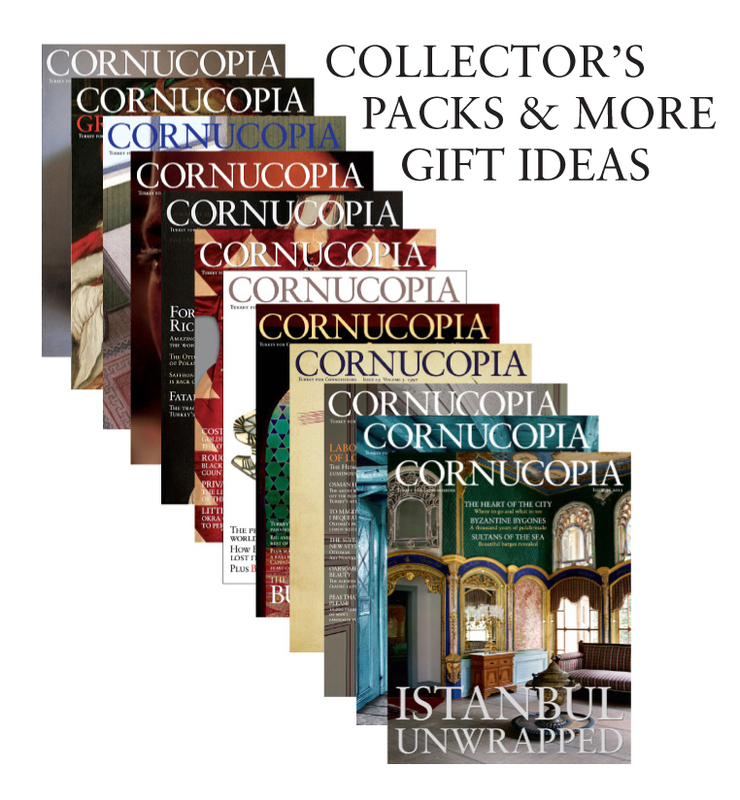 Expert brushwork on canvases of all sizes in (mostly) gold frames from such names as Hoca Ali Riza, Hüseyin Zekai Paşa, Halil Paşa, Osman Hamdi Bey, Şeker Ahmet Paşa, Hüseyin Avni Lifij, Hikmet Onan, Şevket Dağ, İbrahim Çallı, Avni Arbaş, Ali Avni Çelebi, Eren Eyüboğlu and Bedri Rahmi Eyüboğlu, as well as a few European Orientalists such as François Dubois, adorns the walls. The museum is housed in a former shipping warehouse (antrepo), next door to Istanbul Modern – a sign of what’s still to come for this area, already flourishing in the arts. The renovation is über-modern, with plenty of grey steel, bright colours and a blocky design that lends itself well to the original structure. After passing through security at the entrance, climb to the first floor where you will be presented with two options: the red room on the right, showcasing works by 19th-century masters, and the green room on the left, paying tribute to 20th-century painters. Start with the red room. Here there are works such as the one above: a grand view of a procession by the French Neoclassical artist François Dubois (1790–1871), some of whose greatest works reside in the Palace of Versailles. 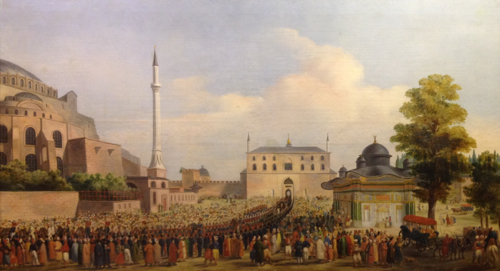 The painting doesn’t reveal where the procession is taking place, but it looks like the gates of Topkapı Palace, with Haghia Sophia on the right. 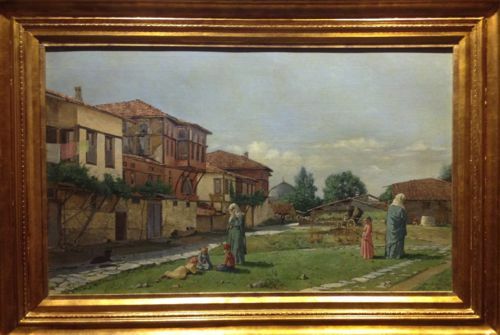 Dubois’s better-known painting of a view in Constantinople is entitled ‘Asakir-i Mansure-I Muhammediyye’. Then there’s the view, above, of an unidentified mosque by Hüseyin Zekai Paşa (1860–1919), best known for his still lifes with fruit. His famous ‘Still Life with Watermelon’ belongs to the Sakıp Sabancı Museum collection. 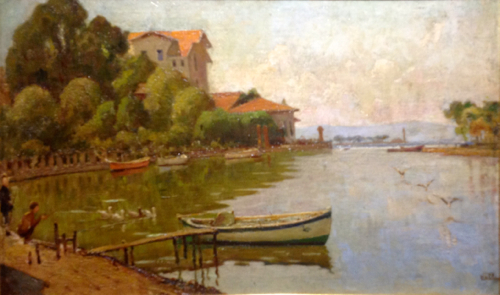 Halil Paşa’s (1857–1939) muted landscape of the seaside in the Kalamış neighbourhood of Kadıköy is also lovely. This painter, who belonged to the ‘Asker Ressamlar’ (Soldier Artists) generation, a group who received their artistic training at military schools in Ottoman Istanbul – was equally skilled at portraiture. There are a number of other paintings from this master, including a cheerful beach landscape. There are two paintings by Osman Hamdi Bey (1842–1910), a great pioneer and the man responsible for giving us the Istanbul Archaeology Museum. The picture above shows his view of Gebze, a district in the Kocaeli Province. 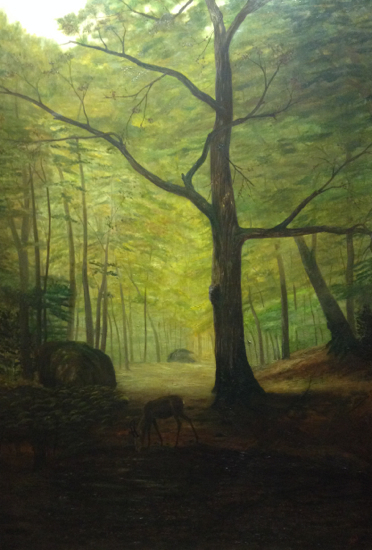 ‘Şeker’ Ahmet Ali Paşa’s (1841–1907) large forest landscape is also alluring. A government official and soldier, Ali Paşa was another important painter of the Soldier Artists generation. He specialised in nature-related subjects – forests, fruits, flowers and animals – and the above is a testament to his skills. 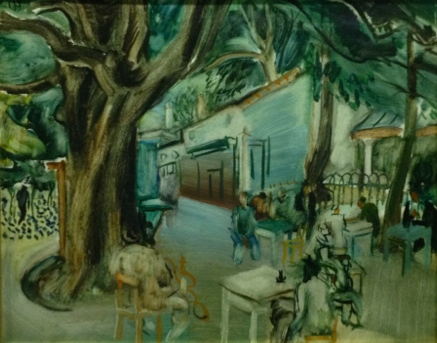 In the green room there is the above landscape by Şevket Dağ (1876–1944), a renowned 20th-century Turkish painter, whose most famous work, ‘Repose’, was sold by Sotheby’s London for $212,574 last year. 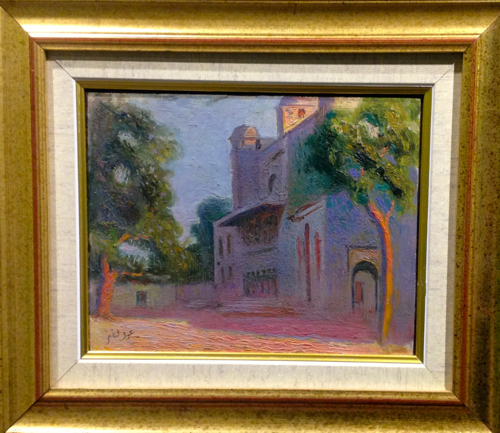 In this quite small painting of the Süleymaniye Mosque, Hüseyin Avni Lifij (1886–1927) uses soft purples, pinks and oranges to show one side of the mosque bathed in the setting sun. 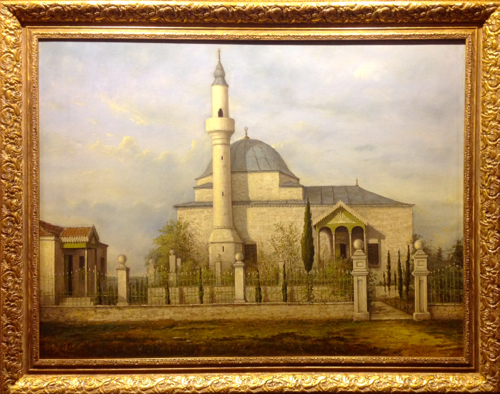 Known for his romanticised views, Lifij paintied and sketched of the Süleymaniye from numerous different angles. 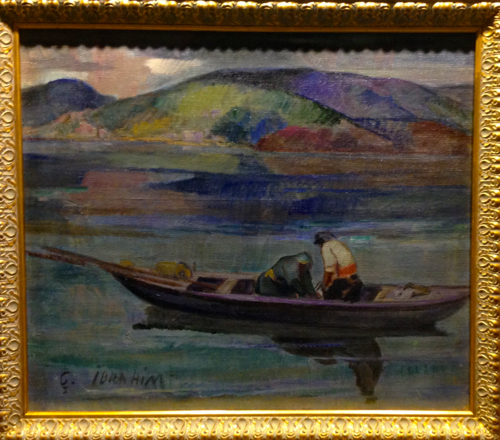 Another 20th-century master, İbrahim Çallı (1882–1960), who studied fine art in Paris and was well known for his sensual nudes and still lifes, turns his brush here to a couple fishing from a boat, with kaleidoscopic mountains in the background. Bedri Rahmi Eyüboğlu (1911–1973), a governor’s son noted for combining traditional decoration and folk handicraft patterns in his work, depicts a coffee house in his signature patchwork style. Eyüboğlu was a pioneer of contemporary art in Turkey in the second half of the 20th century and was well known for his stunning mosaics, some of which (like the panel in the Özlem Et butcher shop at Karaköy Square) can be seen in Istanbul. 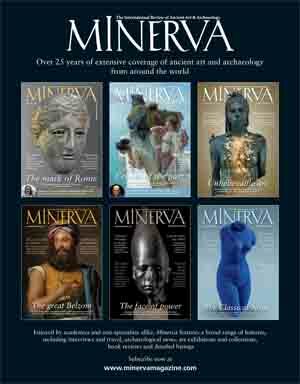 The exhibition runs until September 21, 2014. 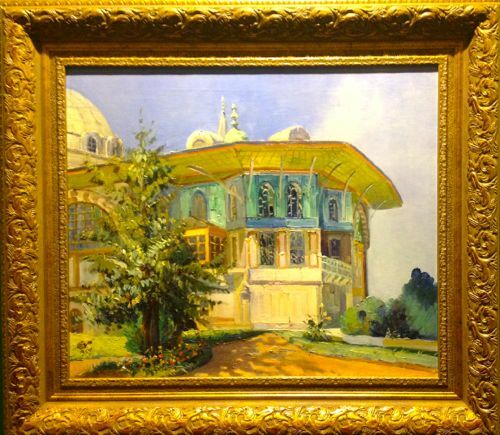 Main image shows François Gilbert’s ‘Fountain Pavilion in Beirut’, oil on canvas, 135 x 95 cm. Open 9am-7pm, last entries 6.30pm. Closed Mondays.